Engineers: Ami Hadani (Soul Train, Good Things); Ami Hadani and Robert Appere (Here Comes The Sun, Girl Don’t Let Me Down); Lewis Peters (Just Free Your Mind); Lewis Peters and Ami Hadani (Run Jody Run). Album cover design by Paul Bruhwiler, Inc.
What do you do when your ensemble (The Watts 103rd Street Rhythm Band) loses one of the best drummers in the business, James Gadson? Well, you try and play the damn things yourself I guess. 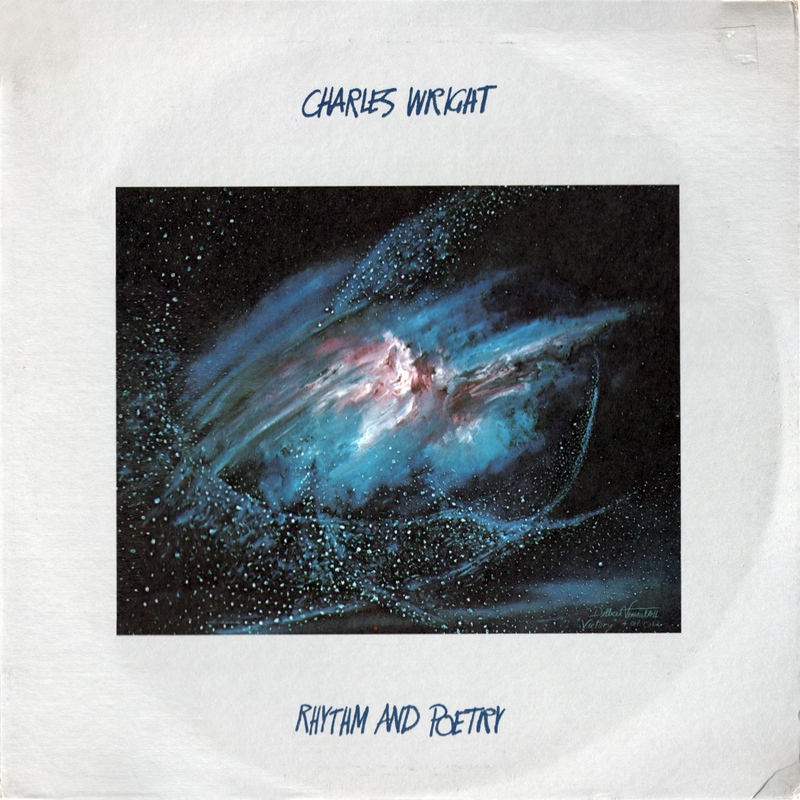 The result, on Charles Wright’s Rhythm And Poetry, is a bit like the first Funkadelic album with a concussion. It’s a fun ride but it’s loose. Very loose. If brain-damaged, synaptically-fried funk is your thing, you’ll love this record. The first track, “Soul Train,” is actually jarring in the sloppiness of the drums, and before looking at the credits on the album jacket I just assumed the drummer was too inebriated to keep time. Then when I saw it was Charles himself playing, I got a chuckle out of his emotive grunts while he did a drum fill worthy of your 12-year old cousin who just got his first trap kit for Christmas. Thankfully drums on the second track are handled by the more competent Harold Potier, but things remain strange when after a minute or two of sharp grooving, Charles bursts into a chorus of “Happy Birthday” for no apparent reason. The next thirteen minutes are a wickedly dirty jam with only a smattering of lyrics about the folkloric “Jody”, the guy always running around with other men’s ladies, and some great low-key fuzzed-out guitar solos from “Sugarbear” Welch. He uses one of my favorite guitar tones here – the sound of a stomp box pedal with a dying 9-volt battery in it! You know Hendrix used to save those things up just to have a supply of almost-dead batteries for his favorite pedals, or so I’ve been told. Charles is back on drums on “Good Thing,” but he redeems himself on this mid-tempo funk number. Of course there is also a curtain of incidental percussion to mask any mistakes. The “set a mood and see what happens” aesthetic of this “Rhythm” A-side of the album is typified in one instant on this song, at the very beginning: somebody barks at Bobby Lexing to ‘lay out’ on the maracas, and Charles, in a slow stoned drawl, retorts with “Let him shaken ’em the way he want to shake ’em…” Brilliant. Things do get a little more coherent on the second “Poetry” side of the LP, with more structured pieces, actual songs. “Here Comes The Sun” is wonderful but then again George is my favorite Beatle. Purists might chafe at Charles’ raspy vocal, but the exquisite horn arrangement is downright regal. The closer, “Just Free Your Mind,” dedicated to the backup singers, is light and uplifting. In fact the entire “Poetry” side is light and uplifting, which seems almost necessary after the relentlessly raw grooves on the “Rhythm” side. As one of my online pals put it when I introduced them to this record – this one is a slow-burner that just keeps on burning all the way to the end. And I appreciate the rough edges a lot here, because in 1972 that roughness was about to slowly become an endangered quality, as funk bands tended to get tighter and tighter, outdoing each other with their instrumental chops and show-stopping arrangements. This record is really music for the sake of it, and we’re just lucky enough to be a fly on the wall. Magnets? How do they work? Tagged Funk, Psychedelic funk, Soul. Thanks man, ashamed to say I only really know Charles Watt from Express Yourself, so looking forward to educating myself with this!